No appointment needed--drop in any time. Get a brief healing, or just sit and watch. It's fun! These clinics are a great way to become familiar with this unique healing style. *Free if it's your first visit, or if you bring someone new. $10 if you've attended before. Additional donations welcome! (For holidays or snow days, call to confirm the schedule). 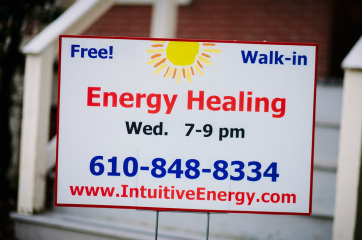 Offered during most Wednesday Free Energy Healing Clinics. Come by for a free mini-healing or reading! Mini-readings and energy healings all day. Stop by and say hi! Easy and fruitful Active Awareness meditation tools. Apply and practice the tools you learned in our Intro course. Learn some new energy tools as well. Start to create on an energy level, rather than just taking what comes along in life. Explore the energy side of communication--make it more effective and less stressful! For students who've taken our Intro class. Continue learning our approach to energy healing in this 5-week class. Includes dealing with energy attacks, remote healings, three methods of self-healing, and more. For women who've completed Female Energy I. Find healing and calm the male way--by doing nothing! Clean out the aggravation, and find your relaxed, male space. For men who've completed an intro class. Meet with the instructor to discuss requirements. 15 weeks, 2 meetings per week. For graduates of our Intuition Training Course. For graduates of the Intuition Training Course. No refunds once class starts. Credit may be available for unfinished classes upon the director’s approval. A partial refund for the Intro Meditation Class may be available under certain circumstances before the start of the second week.